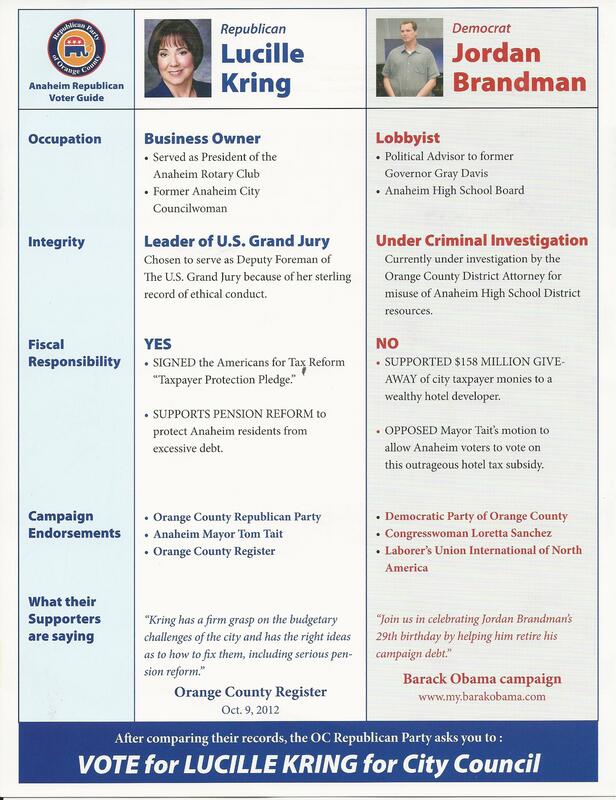 Another mailer that I received over the weekend was this piece paid for by the Republican Party of Orange County. 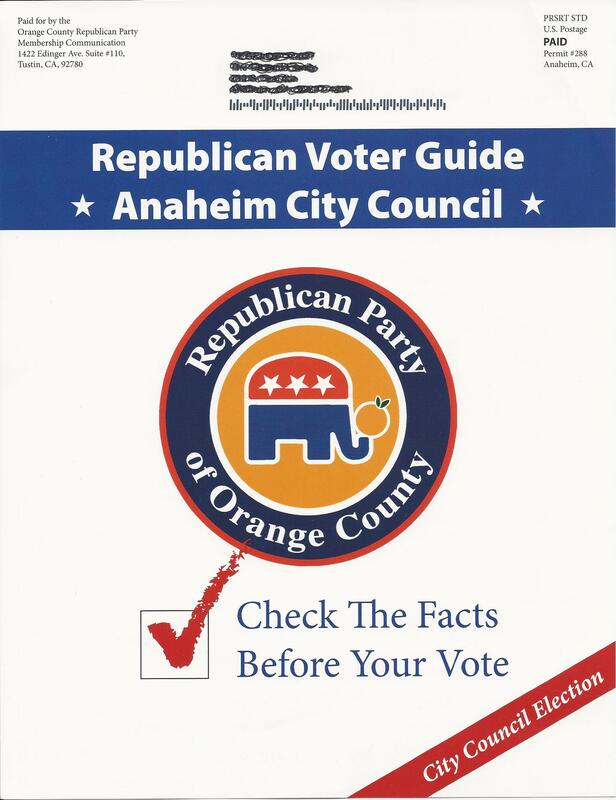 It is another 8.5 x 11 piece with a huge OC GOP logo on the front. On the back it compares Lucille Kring and Jordan Brandman. This entry was posted on October 22, 2012 at 3:12 PM	and is filed under Anaheim. Tagged: Jordan Brandman, Lucille Kring. You can follow any responses to this entry through the RSS 2.0 feed. You can leave a response, or trackback from your own site. Let’s keep it brief. Vote for Lucille Kring. If we lived in Anaheim I would cast my vote for her. Larry Gilbert supports Lucille Kring. Not exactly a confidence booster. What Anaheim does not need is a councilmember who lives to be a councilmember. Being in office is Lucille’s life. It’s like crack to her. She cannot give it up. Doesn’t that give anyone pause? Doesn’t it worry you or anyone else that she hungers after elected office so deeply and completely? She was a weathervane during her two terms. You could rarely rely on her to hold her ground under pressure. Remember during the Disney-SunCal fight, how she said over and over, with a straight face, that she “hadn’t made up her mind” on the issue, when in reality she was in SunCal’s pocket and voting their way? Until the pressue got to be too much and it was obvious SunCal was going to lose and she flipped? She voted for 3-at-50 for the unions, for crying out loud. No wonder she’s on a slate with John Leos. Anaheimister, All of the OC Republican supervisors voted for 3-50 for crying out loud. I’m sure many of them you support now and are close friends with so quit your babbling whining. Interesting, with your attempt to bash Lucille you don’t mention a candidate that you support … Brandman is not a Republican. The only Republicans that support him are mostly the ones getting paid.